On the night of May 3rd, 1942, fifteen-year-old Alma Braithwaite and her fellow boarders at Goldwyn's school huddle in an air-raid shelter as bombs rain down on Exeter in one of the Baedeker raids. By the time the girls emerge, half the school is in ruins and the city centre has been destroyed. Twenty-one years on, Alma lives alone in the family house and teaches music at her old school. She's moderately content, until the death of the long-serving headmistress brings a new broom in the form of the steely, modernizing Miss Yates. A new student starts too - the daughter of a man Alma hasn't seen since 1942, when he played a pivotal role in her life. Suddenly, Alma is taken back to the summer that followed the raids, a summer of numbing loss yet also of youthful exuberance, friendship and dancing. 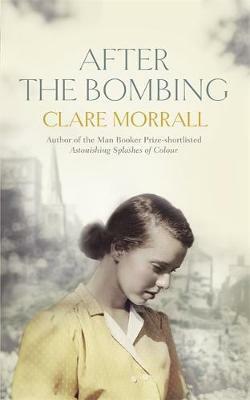 In this enthralling novel, Clare Morrall captures the impact of the Second World War on those at home, particularly the ones too young to take part, and poignantly conveys the long shadow it cast for a generation of women. Morrall has always excelled at portraying individuals who are out of kilter with the world and critical of it . . . The fundamental mystery of the artistic imagination is one of the threads that run through Morrall's novel, along with its destructive effects on those in proximity to the artist and the extent to which every life is fictional . . . Best of all is the portrait of the hapless Quinn. Despite his glamorous back story, he has no outstanding qualities yet is quietly fascinating.